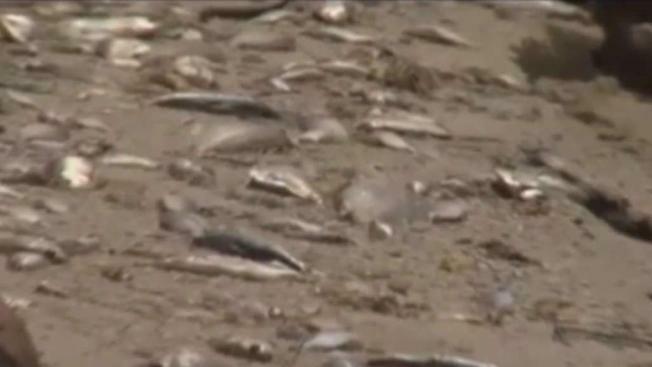 The outbreak of a red tide in southwest Florida is believed to be responsible for the deaths of marine life. NBC 6's Jamie Guirola reports. Florida's toxic red tide, a wave of microorganisms that choke sea life, hit the Gulf of Mexico last November and now spreads over about 130 miles of Florida’s southwest coast. Gov. Rick Scott has issued a state of emergency for seven counties, where waterways and coastlines are filled with putrid fish floating in brass-colored water. The tide also poses a health risk to people, NBC News reported. The microorganisms emit brevetoxins, which can get blown into the air. When the toxins are breathed in, they constrict passages in the lungs, causing people to cough and have difficulty breathing. Dr. Charles Klucka, an allergist with offices in Fort Myers and Punta Gorda, said he has seen 20 percent more patients with breathing difficulty this summer than in previous years, and he believes the red tide is to blame. Klucka said he’s concerned about the lack of research on long-term exposure to brevetoxins. “For people that live exposed months and months, we don’t know the long-term effects,” he said.